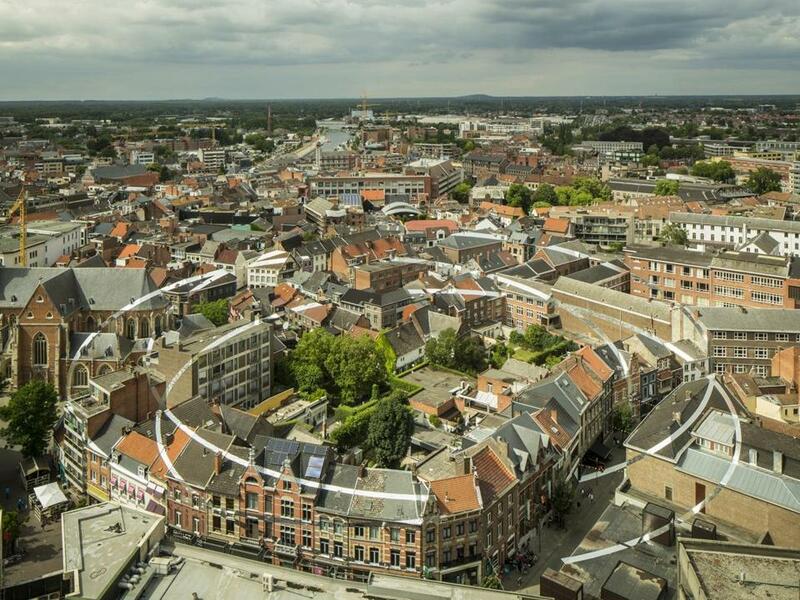 An aerial view of Felice Varini Trois&apos;s installation in Hasselt, Belgium. If you’re walking through the center of Hasselt, Belgium, keep your eyes open for wide strips of white that appear painted on historic buildings. While seemingly random, the lines, both curved and straight, form a pattern across 99 buildings, including shops, houses, offices, and even the small city’s 11th-century St. Quentin’s Cathedral. The adornments, which are actually aluminum-like strips adhered to the buildings, are part of an installation by Swiss artist Felice Varini Trois called “Ellipses Ouvertes en Désordre.” Seen from above, the swaths form an image of three overlapping rings. The entire work, up through Oct. 5, can be viewed from only one spot — the Sky Lounge from the Radisson Blu Hotel, at Torenplein 8.